The Old Town of Vilnius (Lithuanian: Vilniaus senamiestis) is the historic part of the city of Vilnius, Lithuania. It is one of the largest and most beautiful medieval old towns in Europe. It has an area of 3.59 square kilometres (887 acres). The settlement became a town in the early 13th century. The old town is marked by narrow streets, old churches, museums and flower-decorated courtyards. The central squares in the Old Town are the Cathedral Square and the Town Hall Square. In 1994 the Vilnius Old Town was included in the UNESCO World Heritage List. Wikimedia Commons has media related to Vilnius Old Town. 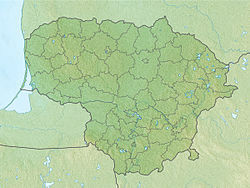 ↑ "Vilnius Historic Centre". UNESCO World Heritage Centre. Retrieved 31 January 2015. ↑ 3.0 3.1 "Unique Old Town of Vilnius". Lietuvos Respublikos Vyriausybė. Retrieved 31 January 2015. This page was last changed on 25 February 2019, at 17:44.